Today’s post comes from Amanda Williams of A Dangerous Business. Amanda lived in New Zealand for a number of months, and kindly agreed to share her tips on what to do as a first timer in NZ. Enjoy! So you’re planning a trip to New Zealand. Aotearoa. “The Land of the Long White Cloud.” It’s a great little country to have an adventure in. 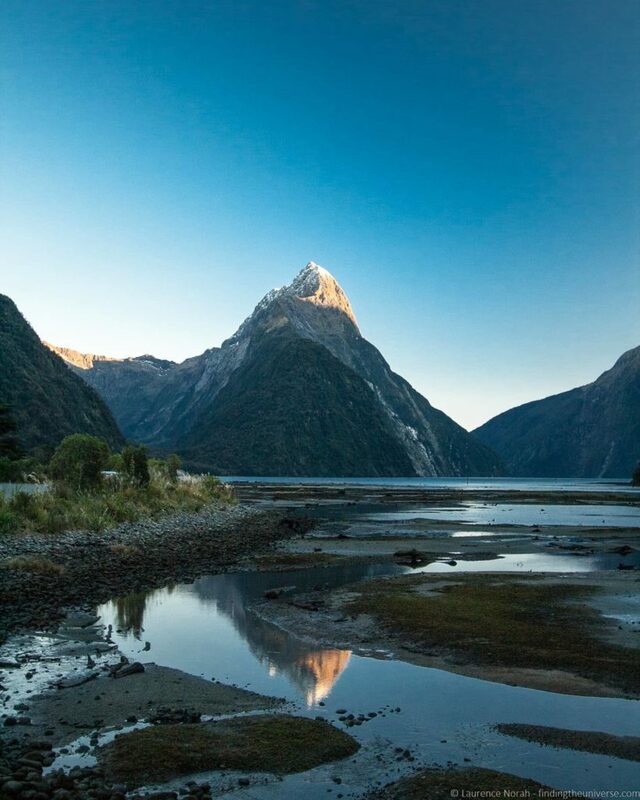 Whether you want to try out some of New Zealand’s adventure sports, tour some of the country’s notable wineries, get a taste of the popular rugby culture, hike some of the most beautiful tracks in the world, or simply get lost in the area’s “no worries” attitude, there’s ample opportunity. But with so many options, how do you choose what to see, where to go, and what to do? 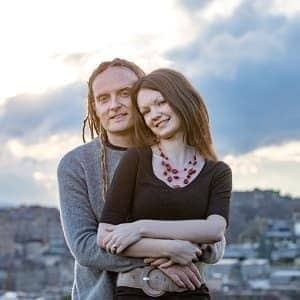 As someone who has spent a fair bit of time in New Zealand, I’m happy to share some suggestions. Here are a collection of Top 5 lists covering all the “musts” in New Zealand, as I see them. Auckland is New Zealand’s largest city. It’s often referred to as “the City of Sails” due to its large harbour and vast number of sailboats that can be seen on the water during the good-weathered months (which are many in this northern city). Explore the city by bus or on foot, making sure to visit the waterfront and take a stroll down Queen Street. For a truly unique day trip, sign up for a tour to “Hobbiton,” the movie set that was used in Peter Jackson’s “Lord of the Rings” trilogy. Located in the small town of Matamata, Hobbiton is an easy 2-hour drive from Auckland. If you book through Red Carpet Tours (www.redcarpet-tours.com), expect plenty of behind-the-scenes stories and glimpses. Located near the centre of New Zealand’s north island, Rotorua is best known for its geothermal activity and Maori cultural offerings. Book a tour to Wai-O-Tapu and the Lady Knox Geyer to get your fill of natural wonders, and then visit Tamaki Village or Te Puia for a Maori cultural celebration and traditional hangi – dinner that is smoked in an earthen oven. If you have time, make the short journey to Taupo from Rotorua. Taupo is a small city that sits on the shore of the great Lake Taupo, with views of three of New Zealand’s most notable volcanoes – Mt. Tongariro, Mt. Ruapehu, and Mt. Ngauruhoe. Taupo and its surrounds are said to have some of the best trout fishing in the world. Grab a bite to eat on the culturally-infused Cuba Street, take a stroll along the waterfront, and head to Courtenay Place after dark for a lively nightlife scene. 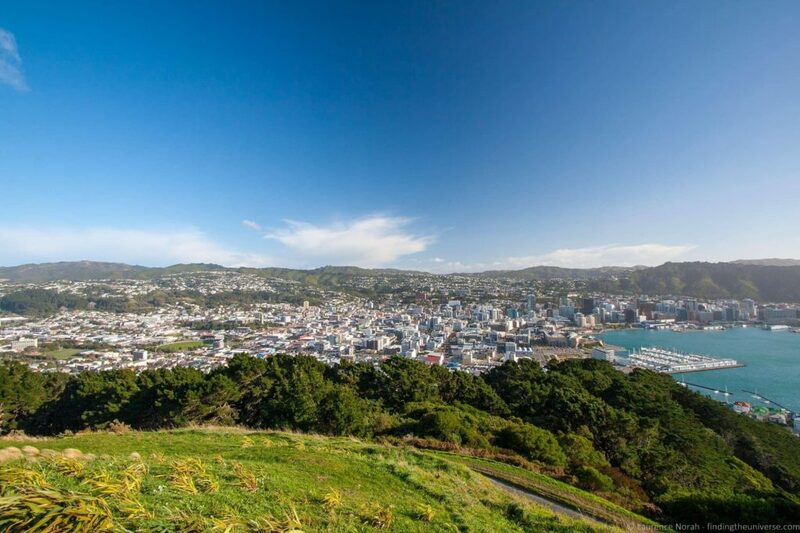 For a bird’s-eye view of the city, either take the historic cable car up to the botanical gardens, or take a bus to the lookout atop Mount Victoria. Looking for a day trip from the Wellington region? Head out into the Wairarapa wine country for a tour and some tastings. Christchurch, the largest city on New Zealand’s south island, is often referred to as “the Garden City.” The city is overflowing with greenery and flowers, along with plenty of interesting churches and architecture. Visit Cathedral Square, take a trolley tour of the city, or even go punting (think like a gondola ride) on the river Avon. If you’re looking to get out of the city for a day, head a couple of hours north up the coast to the quiet coastal town of Kaikoura. Kaikoura boasts New Zealand’s best whale watching experience, as well as opportunities to swim with marine life such as dolphins and fur seals. Plus, the little town is nestled right at the base of an arm of the Southern Alps. Note – since this psot was published, Christchurch suffered a devastating earthquake. Re-development is in progress though! Queenstown, located on the lower half of New Zealand’s south island, is the place to go if you’re in search of skiing, or any of the country’s popular adventure sports. Sitting on one end of Lake Wakatipu and at the foot of the Remarkables mountain range, Queenstown is a stunning locale, no matter what you’re aiming to do. Try bungee jumping or jetboating, take a dinner cruise on the lake, do some souvenir shopping, or take the Skyline Gondola up over the city for an impressive view. Many day trips from Queenstown are available. You could book a day tour to Milford Sound (arguably the most popular tourist destination in New Zealand), or, if you’re looking for something a bit quieter, head up to the town of Glenorchy on the opposite end of Lake Wakatipu for some great scenery. For a bit of history, drive half an hour to the old gold mining village of Arrowtown. Dunedin, while mostly a college town, is still worth a visit if you’ve got some extra time while on the south island. Visit the Cadbury Chocolate Factory downtown for a Willy Wonka-esque tour, admire some of the city’s gothic and Victorian architecture, and climb up Baldwin Street, the steepest street in the world. If you’ve got some extra time, definitely take a drive out to the Otago Peninsula from Dunedin. Here you can tour New Zealand’s only castle (Larnach Castle), see rare yellow-eyed penguins at Penguin Place, and visit one of the only land-based colonies of wild albatross birds in the world at Taiaroa Head. 1. 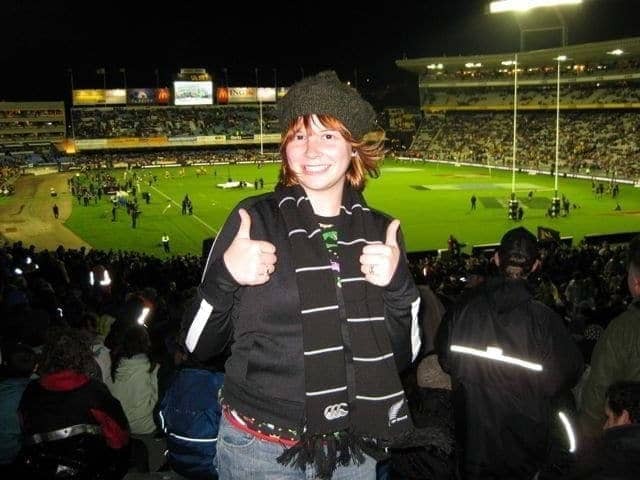 Attend an All Blacks rugby match. Rugby is New Zealand’s national sport, and the kiwis are very supportive of their national team. If you’ve never seen rugby played before, get oriented by seeing one of the world’s best teams in action. 2. Sail through Milford Sound. Whether you visit this natural wonder on an uncharacteristically clear day or on a more typical wet one, Milford Sound is stunning. Tall mountains rise out of the sea, and, when it’s raining, hundreds of waterfalls pour down into the dark water. When it’s sunny, the blues and greens will take your breath away. 3. Take a helicopter ride or fixed-wing plane flight over the Southern Alps on a clear day. Fly from Queenstown to Milford Sound (or vice versa), taking in the snow-capped peaks and crystal-clear mountain lakes. It makes for an expensive afternoon, but I promise it’s worth it. 4. Drive the Southern Scenic Route through the Catlins. Take a roadtrip from Dunedin to Invercargill, being sure to snake along the coast of New Zealand’s south island via the Southern Scenic Route. You’ll pass through an area known as the Catlins, where wind-swept coastal scenes will quickly drain your camera battery. During your south island travels, be sure to make at stop at Mount Cook, New Zealand’s tallest mountain. Getting there, you’ll pass Lake Pukaki and Lake Tekapo – both scenic lakes with uniquely blue water due to glacial runoff. 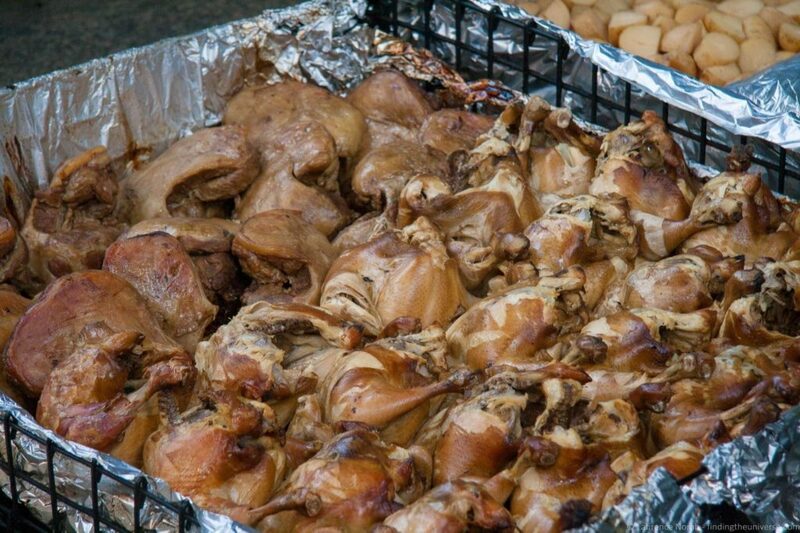 This crazy sport was purportedly invented in New Zealand, and A.J. Hackett bungee operators won’t let you forget it. There are a number of places to bungee across New Zealand, but for the original spot (the Kawarau Bridge) and some truly panic-inducing sites, head to Queenstown. 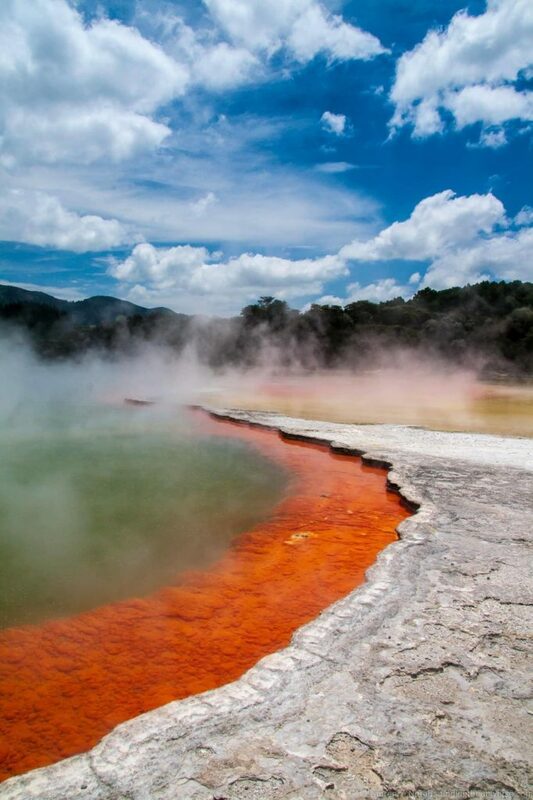 Head to Rotorua for this zany experience. 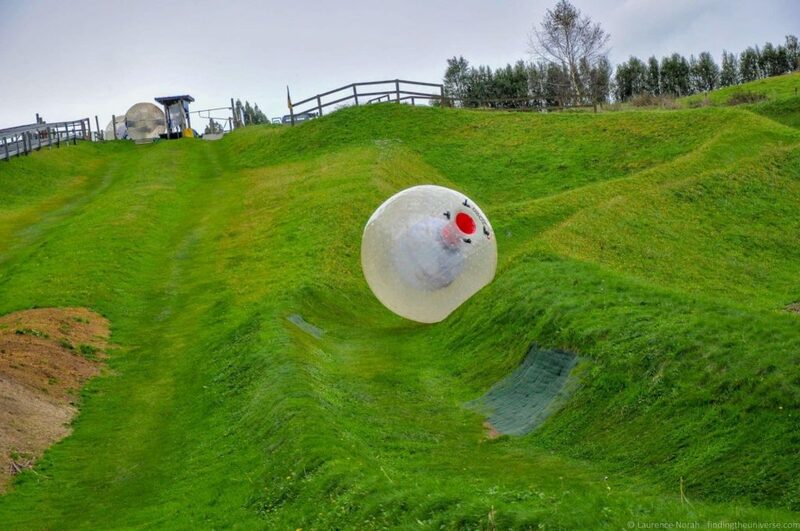 You dive into what looks like a giant plastic hamster ball, and then you tumble down a hill. It’s a blast. Zip through narrow canyons at high speeds and pull 360-degree turns in a boat that skims along the top of the water. Again, you can jetboat all across New Zealand, but the best operation is the Shotover Jet in Queenstown. Want to jump out of a plane? New Zealand offers plenty of opportunity to do just that. Some popular spots to skydive are the Bay of Islands, Taupo with its lake and volcanoes, scenic Wanaka, and, of course, Queenstown. Forget about white water rafting. Instead, coast over those rapids on a modified boogie-board. This Queenstown-based adventure sport is not for the physically unfit, but it’s definitely a rush! Since there are roughly 40 million sheep (and only 10 million people) in New Zealand, you’re likely to find lamb and/or mutton on just about every menu – including Subway’s. This delicious New Zealand specialty comes in two varieties – the traditional green kiwifruit, and the slightly sweeter golden kiwifruit. While definitely an acquired taste, this dark brown paste – made from yeast extract – is an experience any first-time visitor to New Zealand or Australia must have. It’s thick, salty, bitter and sticky, and is most often eaten on top of toast. These mussels are a New Zealand specialty, not to be found anywhere else in the world. They are large and fatty, and have dark green shells with (can you guess?) a green lip, giving them their name. Looking for a tasty dessert? Go for the hokey-pokey. It’s essentially a vanilla ice cream with hunks of sponge toffee mixed in, and it is nothing short of delicious. Even though I’ve spent a lot of time in New Zealand, there are still some things that I never got around to doing. My “next time” list is extensive, but here are my top 5 things that I’d like to do on my next visit. 1. 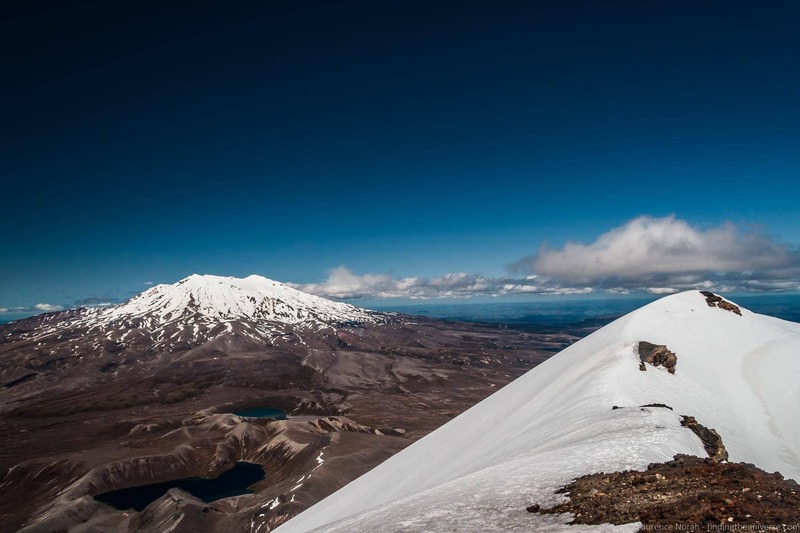 Hiking the Tongariro Crossing. 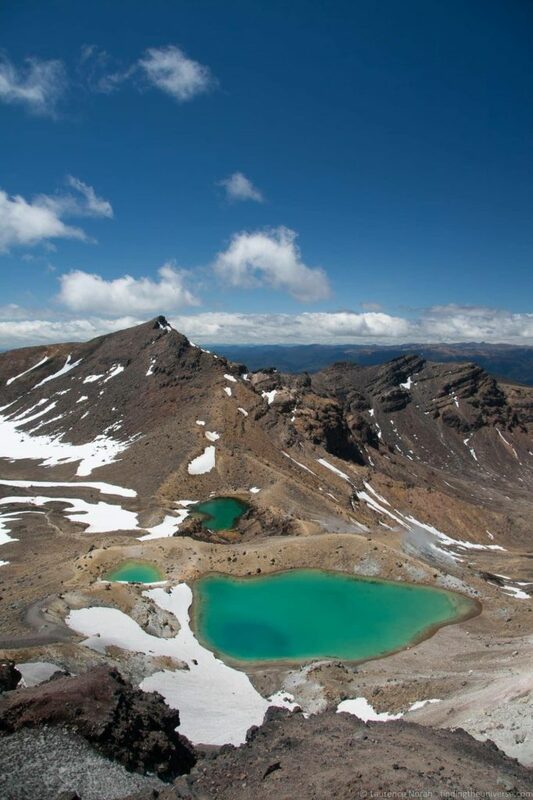 This 18.5-kilometer, day-long trek within Tongariro National Park is supposed to be the best one-day hike in New Zealand – and possibly one of the best in the world. The crossing spans the length of Mt. Tongariro and takes 7-9 hours. It’s not the easiest trek, but all the photos I’ve seen of it (especially the Emerald Lakes) make me think it would totally be worth the sweat and sore legs. 2. Franz Josef Glacier trekking. This 12-kilometer-long glacier sits within Westland National Park on the west coast of New Zealand’s south island. The glacier extends from the Southern Alps through temperate rainforest, and is one of the main tourist attractions on the west coast. Guided and unguided hikes on the glacier are available, as well as helicopter tours that drop you off atop the ice field for a guided trek. 3. Attending the Rugby Sevens in Wellington. Each year in February, Wellington hosts a rugby sevens tournament at Westpac Stadium. Rugby sevens is a modified version of rugby, played with only 7 players on a team (as opposed to the normal 15), and with much shorter matches. Teams from 16 countries compete in the Wellington tournament, and tens of thousands of spectators attend each year. The Welly Sevens has a reputation for having a party atmosphere, and many fans come in elaborate, silly costumes. 4. Swimming with Hector’s Dolphins in Akaroa. On the Banks Peninsula, not far from Christchurch, sits the little resort village of Akaroa. This French-infused town is said to be beautiful and charming. Rare Hector’s Dolphins (only found in New Zealand) call the Akaroa harbour their home, and swimming with these small, friendly dolphins is a popular attraction. This city, located near the top of New Zealand’s south island right on Tasman Bay, is surrounded by mountains on three sides and is best known for its quirky, artsy atmosphere. Nelson also has one of the best climates in the country, often topping national statistics for sunshine hours. As you can see, there’s so much – maybe too much! – to see and do in New Zealand. The possibilities really are endless. I lived there for 5 months and still didn’t fit everything in! But, rest assured, no matter what your travel style or interests, Aotearoa will have something just for you. Here’s to hoping your first time (in New Zealand) is memorable! Thanks Amanda for a truly great post! Amanda can be found talking more about travel and New Zealand on her site, A Dangerous Business. You can also follow her on Twitter, where she posts as @DangerousBiz. Did you know that there was an earthquake a month before this post in Christchurch that completely distroyed the city centre? None of these suggestions are possible for Christchurch city now because most of that stuff has been wiped out. By the way, there’s no way that we have a population of 10million, we are much tinier than that, about half haha. Glad you like writing it, it was great to read and I know it’s going to come in handy! Thanks again! Marmite is HORRIBLE, make sure you avoid!